Story: Jim Shooter. 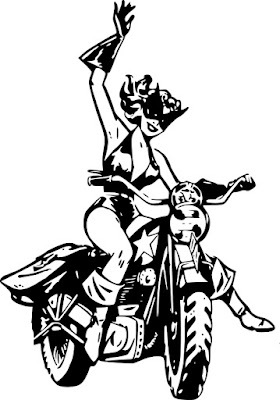 Art: Win Mortimer/Jack Abel. All characters and artwork © and TM DC Comics Inc. There comes a point in every fan's life when you realize that your favorite actor/musician/athlete is a human being and thus capable of doing things you may find unsettling. With fictional characters, it's much the same way. Characters often become our favorites because they represent some aspect of ourselves or what we wish to be like. Identifying with certain characters has advantages—we can use them as role models and adopt traits we admire. However, identifying with a favorite character can also blind us to flaws in the character and in ourselves. Characters are the brain-creations of writers. They represent how the writer sees the character, not how fans wish the character to be. Most writers imbue characters with flaws on purpose—who wants to read about a perfect hero? Sometimes, however, flaws are less obvious and may even be “accidental,” just because the writer is also a human being. While it's fun to discover things about a character you weren't aware of before, it can be unsettling when you realize your favorite character—one you looked up to as a role model—may have some less-than-savory qualities that were there all along. I realized this while re-reading an old story featuring one of my favorite characters, Mon-El. Mon-El is a stalwart member in most incarnations of the Legion of Super-Heroes. Originally introduced as an amnesiac space explorer who was mistaken for Superboy's older brother, Mon had the same super-powers as the Boy of Steel, but a different weakness—common lead instead of kryptonite. Lead poisoning resulting in Mon being placed in the Phantom Zone, where he remained without aging for a thousand years, until a cure could be found. Upon his release, Mon-El joined the Legion and was eventually elected leader of the team. This was the era in which I discovered the Legion, and Mon-El stood out. 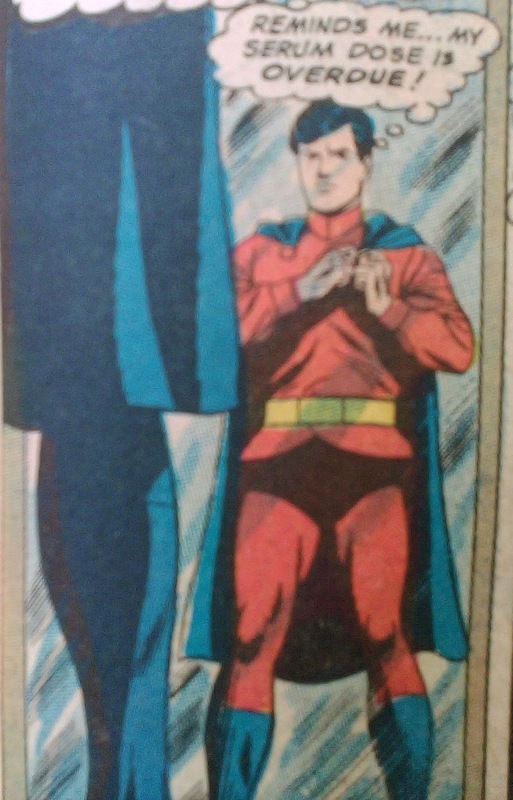 He wore a costume similar to Superboy's, but with opposite colors—a red tunic and blue cape, for example. He cast a dashing figure—powerful and confident, yet responsible and mature. In one story, he remains on duty at Legion HQ with his girlfriend, Shadow Lass, while the rest of the team attends a wedding of two former members. These were all traits I admired and sought to emulate, consciously or not. 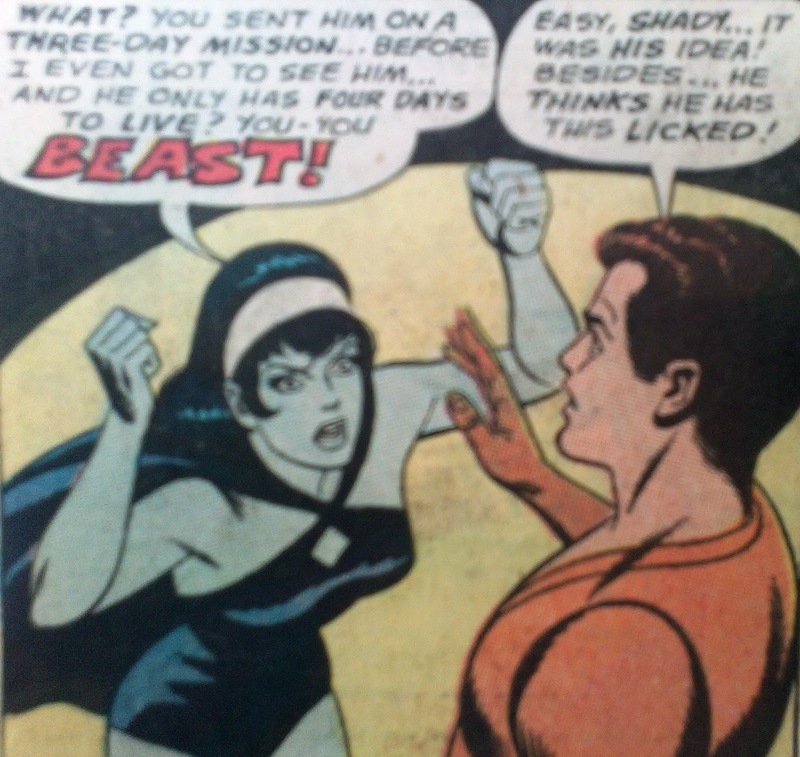 The story which hints at Mon's less-than-savory qualities appeared in Action Comics # 384, January 1970. 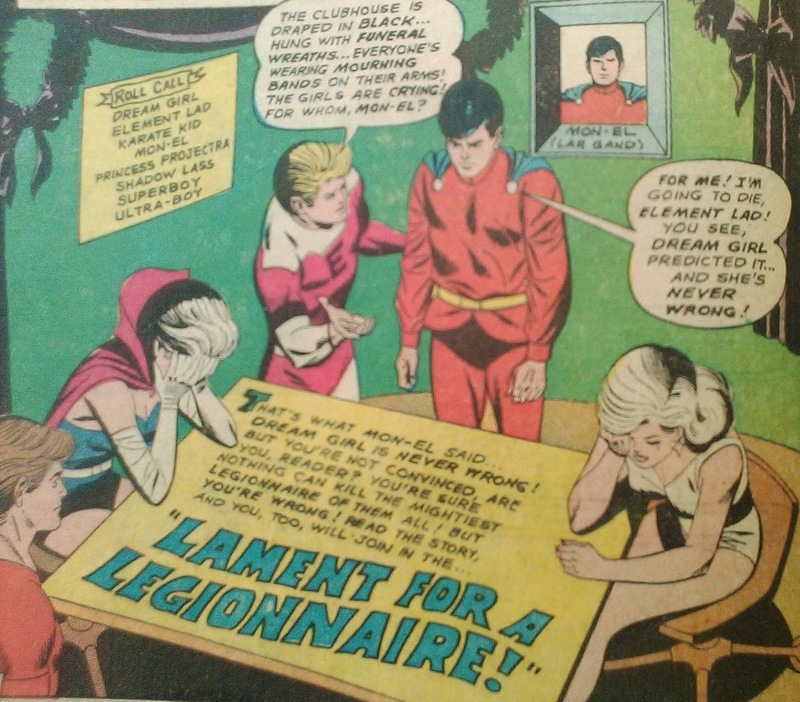 In “Lament for a Legionnaire,” Dream Girl—the Legion's resident seer—predicts that Mon will die in five days. Initially, he receives the news with stoicism, learning to appreciate the sunrise, a shower, and breakfast. Then he decides that maybe he can fight death by stocking up on anti-lead serum and staying busy as a Legionnaire. I won't spoil the story by revealing the twists which ultimately lead to Mon-El surviving his predicted death (though it's not a spoiler to say he does so). However, on re-reading this story, I came to see Mon in a different light. One of the things that jumped out to me was that Mon, facing the possibility of his death, never thinks of his girlfriend, Shadow Lass. One might expect that he would want to spend some time with her or at least say goodbye. Instead he seems to avoid her altogether by embarking on a space mission which lasts three days and departing just before Shadow Lass returns from her own mission. Shady is angry and upset, and even lashes out at the Legion's then leader, Karate Kid. Now, to be fair, Mon may not have been thinking clearly at this point. And, as KK notes, Mon believed he had "licked" the whole death prophecy. Still, you would think he would take Shady's feelings into a account, but he never gives her a thought. If you can't trust your friends . . .
Mon also comes across in this story as exceptionally paranoid and reckless. Since lead is the only thing which can kill him, he takes great precautions to protect the vault in which his anti-lead serum is manufactured and stored. The vault is already secured in such a way that casts doubts on Mon's ability to trust his Legion teammates and friends (the only other people who would have access to the vault), but he goes to extra efforts to seal it off and wreck the elevator that leads to the vault. 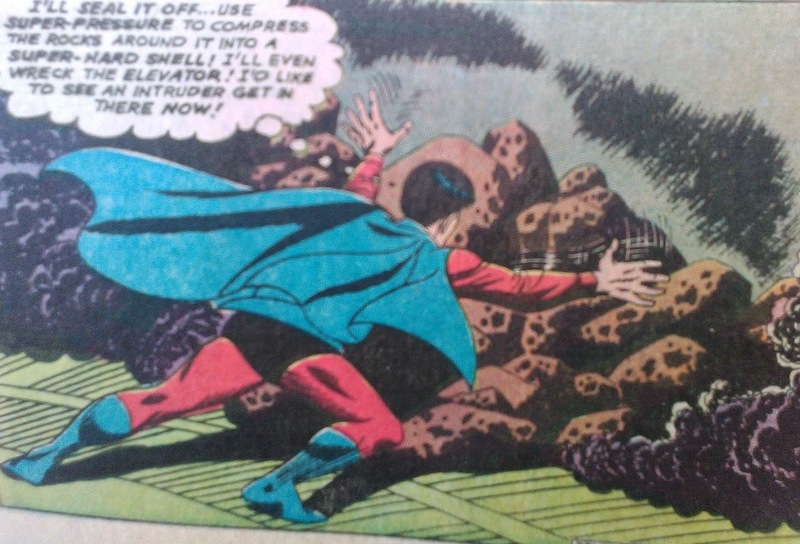 Realizing the elevator was his only way out, he tunnels through the ceiling and comes out on another floor, knocking Element Lad off his feet. Legion stories at the time did not address issues such as structural damage to the headquarters or who was going to pay for all the repairs. (The Legion's benefactor, R.J. Brande, must have gone bankrupt several time footing such bills.) As it is, Mon looks not only paranoid but irresponsible. The last thing I noticed—and this ties into the ending I won't reveal—is that Mon becomes a passive protagonist. The resolution of the story is brought about not through his own efforts but by someone else. It's great that Mon cheats death, but not at the expense of another character. In the stories which follow, we never see Mon erect a statute to this person (the Legion was big on erecting statutes to fallen comrades) or mention this character in any way. Granted, continuity was not very tight in those days and throwaway characters were just that—throwaways. But the story ends with Mon reviving and wondering who this person is. We never get to see his reaction—if any—to the events which have unfolded. The overall impression is that Mon takes his whole near-death experience for granted. Did writer Jim Shooter deliberately imbue Mon-El with flaws such as aloofness, paranoia, irresponsibility, and ingratitude? Probably not. But those traits can certainly be inferred from the story. And that's not a bad thing. In looking at one's favorite character in a new light, we may get to look at ourselves in a new light—including the reasons why we were attracted to the character in the first place. There have been times in my life when I've been accused of having each of these traits—aloofness, paranoia, irresponsibility, and ingratitude—with justification. I don't think I picked up these traits from Mon-El—and certainly not from this story, which I first read in my late teens. Yet perhaps I was attracted to the character because I recognized a bit of myself in him—both good and bad traits. What about you? Have you spotted unexpected flaws in your favorite character?